5.How do we measure best-corrected visual acuity? c. Evaluation under 102.03A. To determine statutory blindness based on visual field loss in your better eye (102.03A), we need the results of a visual field test that measures the central 24 to 30 degrees of your visual field; that is, the area measuring 24 to 30 degrees from the point of fixation. Acceptable tests include the Humphrey Field Analyzer (HFA) 30–2, HFA 24–2, and Octopus 32.
d. Evaluation under 102.03B. To determine whether your visual field loss meets listing 102.03B, we use the mean deviation or defect (MD) from acceptable automated static threshold perimetry that measures the central 30 degrees of the visual field. MD is the average sensitivity deviation from normal values for all measured visual field locations. When using results from HFA tests, which report the MD as a negative number, we use the absolute value of the MD to determine whether your visual field loss meets listing 102.03B. We cannot use tests that do not measure the central 30 degrees of the visual field, such as the HFA 24–2, to determine if your impairment meets or medically equals 102.03B. e. Other types of perimetry. If your case record contains visual field measurements obtained using manual or automated kinetic perimetry, such as Goldmann perimetry or the HFA “SSA Test Kinetic,” we can generally use these results if the kinetic test was performed using a white III4e stimulus projected on a white 31.5 asb (10 cd/m2) background. Automated kinetic perimetry, such as the HFA “SSA Test Kinetic,” does not detect limitations in the central visual field because testing along a meridian stops when you see the stimulus. If your visual disorder has progressed to the point at which it is likely to result in a significant limitation in the central visual field, such as a scotoma (see 102.00A6h), we will not use automated kinetic perimetry to determine the extent of your visual field loss. Instead, we will determine the extent of your visual field loss using automated static threshold perimetry or manual kinetic perimetry. A. 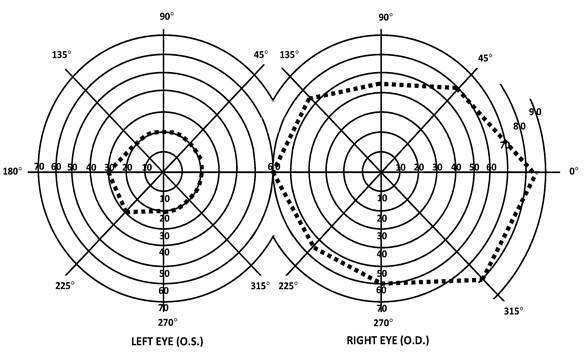 The diagram of the left eye illustrates a visual field, as measured with a III4e stimulus, contracted to 30 degrees in two meridians (180 and 225) and to 20 degrees in the remaining six meridians. The visual efficiency percentage of this field is: (( 2 x 30) + (6 x 20)) / 5 = 36 percent. d. Visual efficiency. Under 102.04A, we calculate the visual efficiency percentage by multiplying your visual acuity efficiency percentage (see 102.00A7b) by your visual field efficiency percentage (see 102.00A7c) and dividing by 100. For example, if your visual acuity efficiency percentage is 75 and your visual field efficiency percentage is 36, your visual efficiency percentage is: (75 x 36) / 100 = 27 percent. 2.What audiometric testing do we need when you do not have a cochlear implant? (i) We generally need pure tone air conduction and bone conduction testing, speech reception threshold (SRT) testing (also referred to as “spondee threshold” or “ST” testing), and word recognition testing (also referred to as “word discrimination” or “speech discrimination” testing). This testing must be conducted in a sound-treated booth or room and must be in accordance with the most recently published ANSI standards. Each ear must be tested separately. g. Screening testing. Physiologic testing, such as ABR and otoacoustic emissions (OAE), and pure tone testing can be used as hearing screening tests. We will not use these tests to determine that your hearing loss meets or medically equals a listing, or to assess functional limitations due to your hearing loss, when they are used only as screening tests. We can consider normal results from hearing screening tests to determine that your hearing loss is not “severe” when these test results are consistent with the other evidence in your case record. See Sec. 416.924(c). 5.What do we mean by a marked limitation in speech or language as used in 102.10B3? B. An MD of 22 decibels or greater, determined by automated static threshold perimetry that measures the central 30 degrees of the visual field (see 102.00A6d). C. A visual field efficiency of 20 percent or less, determined by kinetic perimetry (see 102.00A7c).